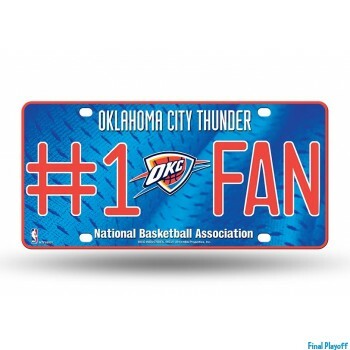 Spread team colors and spirit with official Oklahoma City Thunder license plates that are sure to be a big hit amongst fellow fans. Shopping for the right metal Oklahoma City Thunder license plate is easy with embossed designs to choose from. Plastic diecut Oklahoma City Thunder license plates are popular with pre-drilled holes for easy mounting on walls or doors being light weight.